Ahead of our Spring Foraging for Wild Edibles Workshop this weekend, Project Manager of our Outdoor Projects team, Jackie, shares a recipe for using wild garlic. 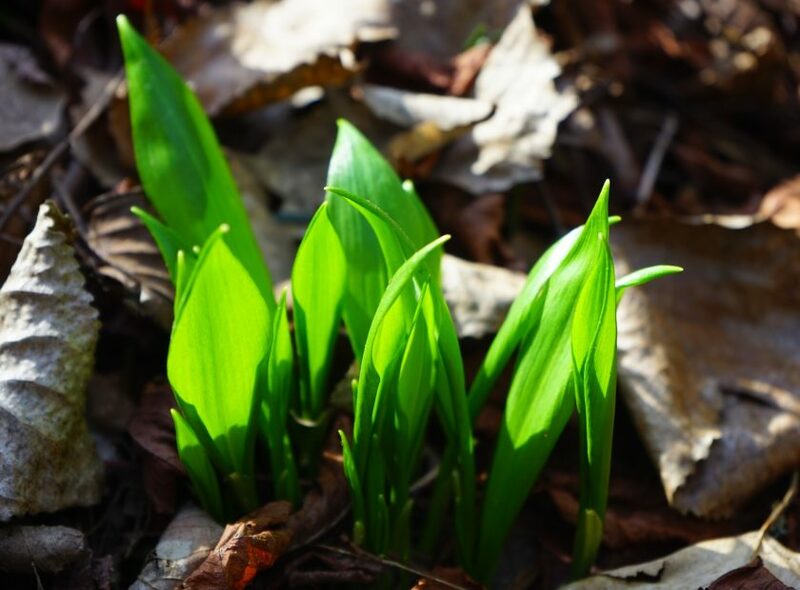 Wild garlic is one of the first spring greens, arriving in late March/April in shady or wooded areas. You can’t miss the smell if you’re out walking. To harvest it you should take the smaller leaves (the bigger ones can get a bit stringy and bitter) but leave the roots behind so there will be more next year. Make sure you’re taking it from an area that hasn’t been visited by dogs. You can use the leaves finely chopped in omelettes, pasta sauces, and risottos to give a mild garlic flavour. If you’re roasting a chicken, stuff it with the leaves for a subtle garlic flavour. It also makes a great pesto which is very versatile – use it on pasta, as a salad dressing, swirled in soup or in a toasted sandwich with soft cheese or tofu. It will keep in the fridge for a week or so if sealed tightly. 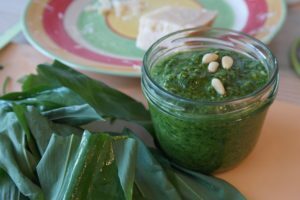 Rinse the wild garlic and place in a food processor with the parmesan and a pinch of salt. Blitz until it turns into a paste. Add the nuts and blitz more, then add the oil until you get the consistency you want. Season and add a squeeze of lemon juice to taste. Spoon into a jar and cover with a layer of oil to keep it fresh then seal tightly and keep in the fridge. It’s also possible to make this with a mortar and pestle, following the same steps. If you’d like to find out more about foraging for wild herbs why not come along to our workshop Spring Foraging for Wild Edibles Workshop this Saturday 6th April in our Community Training Garden at Ravenscraig Walled Garden.